In teaching you cannot see the fruit of a day’s work. It is invisible and remains so may be for 20 years. 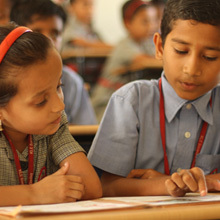 Our teachers and facilitators at the schools are qualified, professional and committed individuals dedicated to overall development of the child's personality, skills and ability, which is in accordance with our commitment to focus on individualistic needs rather than the generic instructional methodology. Each classroom accommodates only 35 students and the school maintains a Student :Teacher ratio of 22:1.